The assassination of John Lennon forever changed music and shocked the world. Mark David Chapman was a delusional and a socially awkward man who was obsessed with Lennon and the novel Catcher in the Rye. Based on the novel by Jack Jones "Let Me Take You Down," the film follows Chapman for three days leading up to his murder of the Beatles legend, in front of Lennon's hotel, The Dakota. First time writer and director J.P. Schaefer helms Chapter 27 and does a great job with the development and psyche of Mark David Chapman. The development of Chapman's delusions, thoughts and interactions are chilling to the viewer, but unfortunately do not provide a big enough impact to save the rest of the film. The rest of the film falls flat with bad pacing and a annoying waiting game outside of the Dakota Hotel where Chapman spends three days waiting and ploting to meet and kill John Lennon. 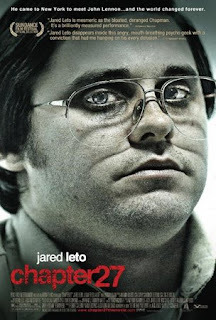 Jared Leto deserves alot of credit for the weight he gained trying to emulate Mark David Chapman. Leto furthermore, does an amazing job of becoming and portraying Chapman. He really was perfect. Leto's performance is haunting as the deranged killer and gives the viewer a intimate look into Chapman's delusional psyche. Leto's performance is highlighted by the monologues and inter-development of Chapman, but his outside relationships and devlopment throughout Chapter 27 dramatically suffer, just like in Chapman's real life. It was somewhat deflating to have such a superb performance, but only a marginal film. Everything outside of Chapman's personna just seems to fall flat time and time again in Chapter 27. Just like Mark David Chapman's knack for having awkward social interactions in his real life, most of Leto's scenes with supporting cast feel disconnected and do not help with the development of the film. They do however point to his social awkwardness, but seem pointless when Leto, already perfectly portrays a character who seems extremely introverted. Lindsay Lohan plays Jude, another fan who also waits for a chance to meet John Lennon, but her performance and character are so meaningless to the development of the film, you wonder why it wasn't cut. Chapter 27 was a film that had alot of potential, especially with the phenominal performance of Jared Leto, but instead missed the mark. The overall problem came with the waiting game in front of the hotel and no real story post the assassination of John Lennon. The story suffered from bad pacing that dragged its feet with Chapman standing and thinking in front of the Dakota. Leto's performance nailed the personna of Chapman so intricately and accurately that the script ended up seeming to small for the performance. Finally, Chapter 27 was a vivid look into the mind of Mark David Chapman and what drove him to murdering John Lennon, but the story doesn't measure up to the impact of the true events.